Characters/ Players awaken in an unknown video game world. Their last memory is of different things, some could be driving a car, arguing or skateboarding. fun memories. The world is very mystical and fantasy looking. 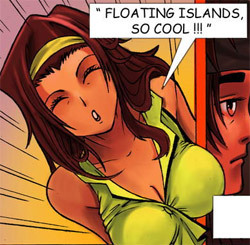 Floating islands, 2 suns aka magical. All characters aka 2000 people wake up in a town not knowing how they got there or what is going on. All wearing the same low level looking outfits. A level 40 monster appears that eats a few of the players and chases them. They all run and are saved by A "player" who is level 50 and he tells them he is the only survivor of the last group of people that were brought to this world. He tells the new players that they are stuck in a game and that the only way to get out is to kill the "Dark Emperor" or evil force and beat the game. A deep and extensive "dream", as long as a lifetime goes into it, so real, so convincing, so undeniable, that never believe if I told you this one ...... until you wake him. What if one day you discover that this reality is not as ... "real", and calls into question everything you believe in, to live it would deny or just ..... I accept? if you could go crazy in the process. 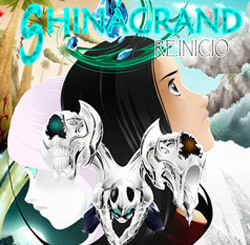 Aida faces this test and more with other characters in shinágrand, a story that revolves in part on the fact that it is the real find in what he sees, in the most commonly known, as that to which he had never seen before. Mystery, Action, Drama and Fantasy something .... (maybe not) is trying to capture what is best in this comic. Have a nice week and remember: a comics a day keeps the doctor away!